Nautical Balustrading started with stainless steel wire balustrades in 1996. I now fabricate and install tubular stainless steel railings with horizontal or vertical stainless steel wire infill, frameless glass balustrades, frameless glass pool fencing and powdercoated aluminium railings with toughened safety glass, stainless steel cables or baluster infill. Railings and handrails are suitable for staircases, decks and pools. I have refined systems that are both strong and stylish and offer a reliable, dependable and competitive product. I offer superior strength, style and setout. My factory is located at Warriewood and I generally work on Sydney's Northern Beaches, servicing the suburbs surrounding Manly, Brookvale and Mona Vale, the North Shore including North Sydney, Chatswood and Hornsby, the Hills District and Eastern Suburbs. I am licenced and insured to fabricate and install balustrading and pool fencing. This means you have insurance if something goes wrong, unlike DIY balustrade systems. If you would like a quote please send me a sketch or photo with measurements and I will give you a price. If you are still keen I would then love to come and see you. You are also welcome to drop into factory at Warriewood and have a look at samples. Please call first. Thanks so much for such a great job on our pool fence. We really appreciated all of your input into solving some of the difficulties associated with this job and for always being right on time with your quoted delivery and meeting times with us. You run a very professional business. It was a real pleasure having you do this work for us. I would highly recommend Nautical Balustrading and Steve Shimeld. Steve listened to what we wanted and were trying to achieve and made some great suggestions. Nautical Balustrading hand made our balustrading and gate and kept us informed throughout the process. I particularly was impressed with his timing, when he gave dates and times for quoting, measuring and installing, he was always present and on time. 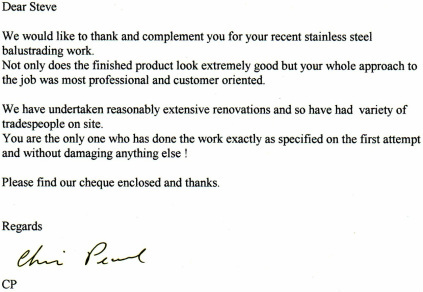 We love our balustrading, it is exactly what we wanted and the quality is first rate! My husband and I have absolutely no hesitation in highly recommending Nautical Balustrading. We are delighted with the stainless steel balustrade supplied and installed by Nautical Balustrading. We were very impressed with Steve Shimeld’s reliability, helpful advice, attention to detail, and the high quality of the finished job. For these reasons we have already recommended him to friends.